Fancy a change from the regular drinking glasses? Try vintage style drinking bottles. 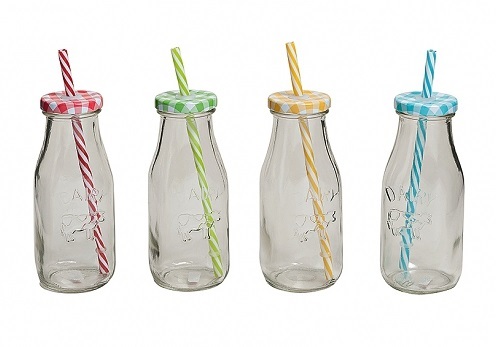 Old style milk bottle has a colurful metal screw top lid with a hole for a matching plastic straw. Owing to the lids your drinks are safe from spilling. Perfect for outdoor picnics and barbeques - the lid also protects the beverages from pesky insects. Several colours of lids available - assorted.